The borough was divided into four wards in 1938,but no elections were held during the war and th council filled any vacancies. 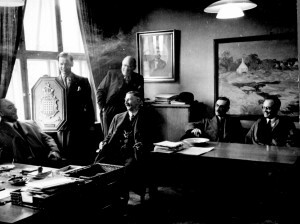 The mayor, his deputy,and three councillors formed a War Emergency Commitee which met in private and conducted most of the borough affairs. After the war, a new council was elected and was busy for some years in restating property and amenities after military occupation. The former G.E. 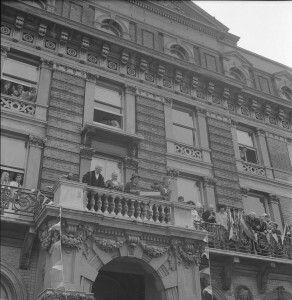 Hotel became the Town Hall in 1951, providing an elegant setting for civic functions and the visit of H.M. the Queen and Prince Philip on March 24, 1958. 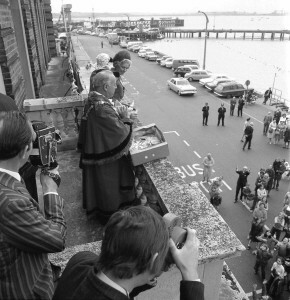 The Harwich Borough Council handed over to Tendring District Council in 1974. 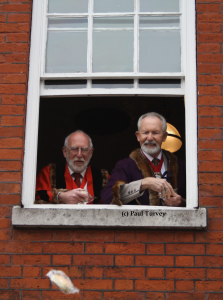 As part of the proceedings, the Mayor and associated Council members proceed along Church Street to the Guildhall. many wear the traditional robe and black bicorne hat, as does the Mayor, who is distinguishable by his Mayoral chain. The leading dignitary carries a staff. 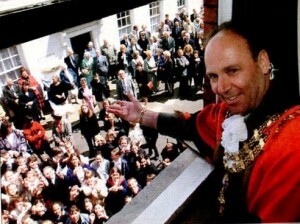 Children wait excitedly, outside The Guildhall, then above, the Mayor stands on the Guildhall balcony. 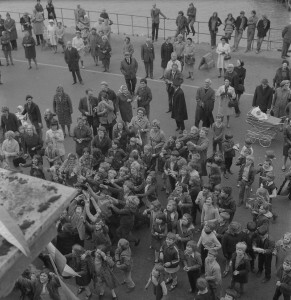 Keeping the ancient Harwich tradition, the newly appointed, and assisting dignitaries, throw ‘kitchels” to the children (and adults) below. 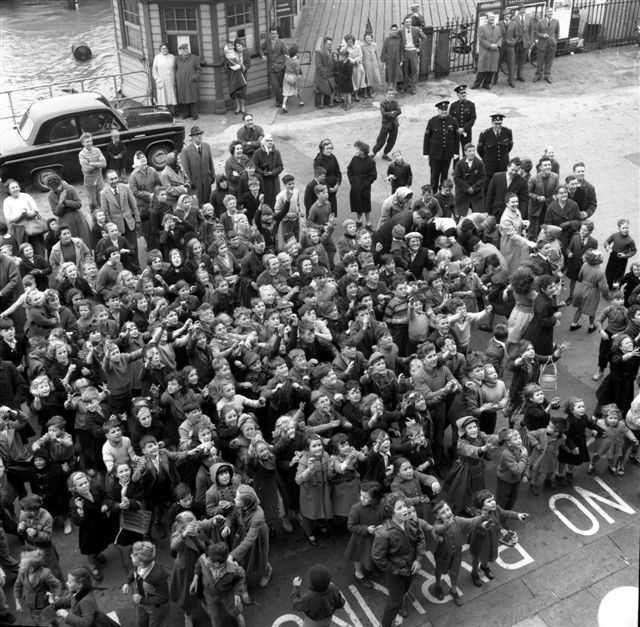 On the third Thursday in May (from 1949) every year the Guildhall is the scene of the Mayor-making ceremony. 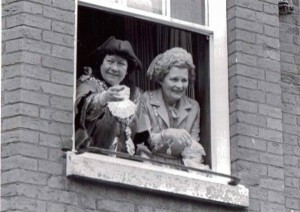 After the formal proceedings the new Mayor and Mayoress maintain the ancient and happy tradition of throwing “kitchels” to the crowd of children in the street below. For more than 300 years Harwich has elected a Mayor, and at some time during this long period one of the citizens so honoured had the happy idea of distributing to the people of the town small cakes, But, like your apple, they were much more than mere cakes. 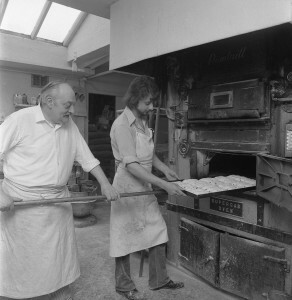 They were called kitchels; an old Anglo Saxon name for the small cakes which was the customs of god-parents to give their god-children whenever they asked for a blessing, Thus the Mayor in distributing these small cakes or kitchels was giving his blessing to the people of his town as he started a new year of office. Down through the years the custom has persisted – although more often in recent years the kitchels have been called “catch-alls” because it was custom to try and catch them as they were thrown from the Guildhall windows. Historic Day for Harwich as Town Hall is Opened. At a cost of £7,000 the Borough Council converted, decorated and equipped the old formerly derelict Great Eastern Hotel as a magnificent municipal headquarters. Representatives of neighbouring councils and Essex County Council were among those who witnessed the opening of the new Town Hall, and there was general commendation for the appearance of the building and the fine accommodation which it provided for all municipal needs. Brilliant autumn sunshine greeted the company which assembled on the quayside outside the new Town Hall on October 12 1951, for the opening ceremony and the old building itself was looking its gayest for many years with a generous display of bunting that for the oldest residents brought back memories of formers glories when the building was a luxury hotel. The formal opening of the building was a delightfully simple ceremony. 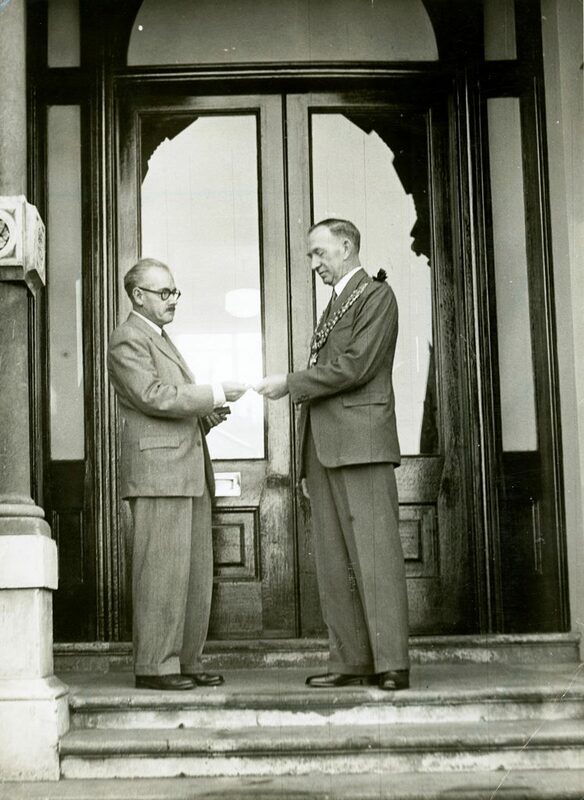 The Mayor, wearing his chain of office, was greeted by the borough architect, Mr. Allan W. Vincent, who presented him with a silver key to the main entrance of the building, a memento of the occasion and inscribed with the date and details of the ceremony. 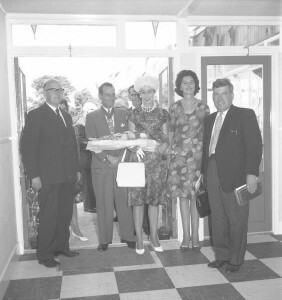 Having opened the door to the building, Alderman Gant led his guests into the foyer of the building where he unveiled as a formal gesture of opening an oak plaque recording the date of the opening and that the building had been opened by Alderman Gant. 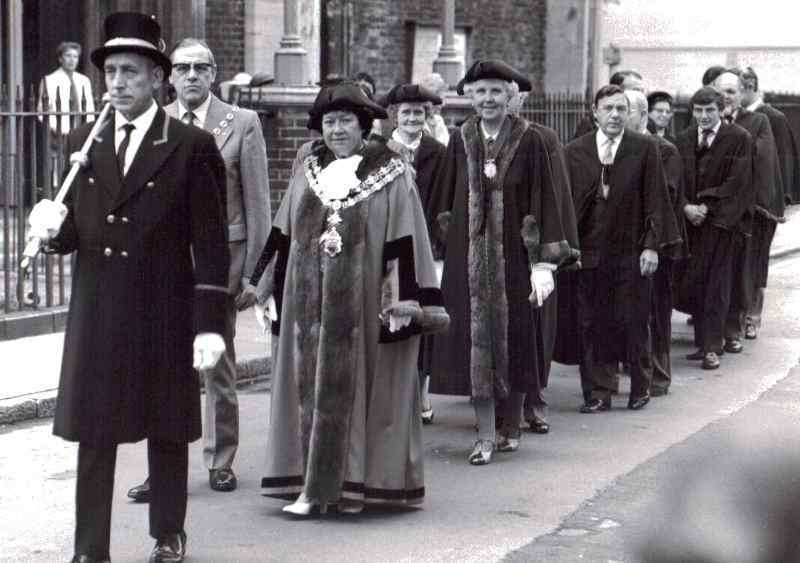 The tradition of Mayor-making and annual event since the first Mayor of Harwich, John Hacklin, was elected in 1604 was swept away when the council took over the borough on the 31st March 1974. The new Mayor of Harwich, Ald Len Weaver, made history when he was elected the last mayor of the borough. 1604 John Hankin. 1605 Edmund Seaman. 1606 James Barker. 1607 Robert Bence. 1608 Robert Smart. 1609 Henry Hankin. 1610 John Hankin. 1611 Robert Goodwin. 1612 Thomas Shrive. 1613 Robert Offley. 1614 Edward Rafe. 1615 William Wye. 1616 Edmund Seaman. 1617 William King. 1618 Robert Russell. 1619 Robert Goodwin. 1620 Richard Smart. 1621 Robert Lee. 1622 Nicholas Sack. 1623 Thomas Shrive.1624 Edmund Seaman. 1625 John Allen. 1626 Robert Goodwin. 1627 Richard Smart. 1628 Thomas Thompson. (Nicholas Sack) 1629 Richard Hankin. 1630 Hugh Branham. 1631 Robert Hart. 1632 John Heard. 1633 Richard Smart. 1634 Walter Stanley. 1635 John Peck. 1636 John Rolfe. 1637 Richard Hankin. 1638 Roger Coleman. 1639 Arthur Hawkes. 1640 John Mace. 1641 Edmund Seaman. 1642 John Rolfe (dec’d)- Arthur Hawkes. 1643 Richard Hankin. 1644 Roger Coleman. 1645 Arthur Hawkes. 1646 Robert Pascall. 1647 Thomas Crispe. 1648 Richard Hankin. 1649 William Chapman. 1650 Thomas King. 1651 Arthur Hawkes. 1652 James Sack. 1653 Richard Hurlock. 1654 Richard Hankin. 1655 John Hunter. 1656 Daniel Cole. 1657 Richard Smart. 1658 Anthony Woollard. 1659 Miles Hubbard. 1660 Arthur Hawkes. 1661 Thomas Keys. 1662 George Coleman. 1663 James Sack. 1664 Arthur Hawkes. 1665 Edward Robinson. 1666 John Hunter. 1667 William Garrard. 1668 Henry Munt. 1669 Thomas Keys. 1670 George Coleman (dec’d) – Thomas Langley. 1675 Sir Anthony Deane. 1676 Samuel Newton. 1677 Thomas Langley. 1678 Edward Robinson. 1679 John Browne. 1680 Robert Seaman. 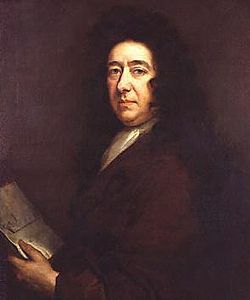 1681 Sir Anthony Deane. 1682 Daniel Smith. 1683 William Garrard. 1684 John Rolfe. 1685 Simon Sandford. 1686 John Browne. 1687 Charles Smith. 1688 Capt. Thomas Langley. 1689 Robert Seaman. 1690 Daniel Smith. 1691 Capt. Richard Tye. 1692 Simon Sandford. 1693 Thomas Langley, Jnr.1694 Charles Smith. 1695 Daniel Smith. 1696 Thomas Langley, Jnr. 1697 William Rudland. 1698 Capt. Richard Tye. 1699 Capt. Richard Grey. 1700 Simon Sandford. 1701 Philip Deane. 1702 Charles Smith. 1703 Daniel Smith. 1704 Thomas Langley. 1705 Capt. Richard Tye. 1706 Capt. Richard Grey. 1707 Capt. John Phillipson. 1708 Simon Sandford. 1709 Philip Deane. 1710 Capt. Maddison Hunt. 1711 Daniel Smith. 1712 Thomas Langley. 1713 Capt. Madison Hunt. 1714 Capt. Samuel Lucas. 1715 Thomas Osborne. 1716 Capt. Richard Tye. 1717 Capt. Maddison Hunt. 1718 Miles Rudland. 1719 Capt. Samuel Lucas. 1720 Capt. John Phillipson. 1721 Thomas Philips. 1722 Daniel Smith. 1723 Capt. Samuel Lucas. 1724 Capt. John Phillipson.1725 Capt. Samuel Lucas. 1726 Thomas Phillips (dec’d). – Thomas Osborne. 1727 George Rolfe. (dec’d) – Giles Baker. 1728 Capt. Samuel Lucas. 1729 John Newell. 1730 Giles Baker. 1731 James Clements. 1732 Giles Baker. 1733 Capt. Thomas Wimple. 1734 Capt. Anthony Deane. 1735 Capt. John Phillipson. 1736 Giles Baker. 1737 Capt. John Phillipson. 1738 Giles Baker. 1739 Capt. John Phillipson. 1740 Giles Baker (dec’d).- James Clements. 1741 Capt. Anthony Deane. 1742 James Clements. 1743 Griffiths Davies. 1744 James Clements. 1745 Griffiths Davies. 1746 James Clements. 1747 Capt. Thomas Wimple. 1748 Robert Page. 1749 Capt. Samuel Phillips. 1750 Griffiths Davies. 1751 Capt. Samuel Cockerell. 1752 James Clements. 1753 Griffiths Davies. 1754 Robert Page. 1755 James Clements. 1756 Griffiths Davies. 1757 Henry Stevens. 1758 Griffiths Davies. 1759 Henry Stevens. 1760 Griffiths Davies. 1761 Henry Stevens. 1762 Griffiths Davies. 1763 Henry Stevens. 1764 Griffiths Davies. 1765 Henry Stevens (dec’d) – Joseph Orlibar. 1766 Griffiths Davies. 1767 Joseph Orlibar. 1768 Griffiths Davies. 1769 Joseph Orlibar. 1770 Griffiths Davies. 1771 Joseph Orlibar. 1772 Griffiths Davies. 1773 Joseph Orlibar. 1774 Griffiths Davies.1775 Joseph Orlibar. 1776 Griffiths Davies. 1777 Joseph Orlibar. 1778 Charles Fox. 1779 Capt. James Bossom. (dec’d)- Capt. Phillips Baggott. 1780 Henry Pelham Davies. 1781 Rayner Cox. 1782 John Hopkins. 1783 William Crowder. 1784 Charles Cox. 1785 Capt. Phillipson Baggott. (dec’d) – John Hopkins. 1786 Rayner Cox. 1787 William Crowder. 1788 William Deane. 1789 Charles Cox. 1790 Rayner Cox. 1791 Capt. Phillips Baggott. (dec’d) – John Hopkins. 1792 William Crowder. 1793 Charles Cox. 1794 Rayner Cox. 1795 Thomas Shearman. 1796 William Deane (dec’d) – James Pulham. 1797 John Hopkins. 1798 Charles Cox. 1799 Joseph Graham. 1800 Rayner Cox. 1801 Admiral Thomas Boston. 1802 John Hopkins. 1803 Charles Cox. 1804 John Hopkins. 1805 Joseph Graham. 1806 John Hopkins. 1807 Thomas Pulham. (dec’d) – Joseph Graham. 1808 Anthony Cox. 1809 John Hopkins. 1810 Joseph Graham. 1811 John Hopkins. 1812 Joseph Graham. 1813 John Hopkins. 1814 Joseph Graham. (dec’d) -Henry Deane. 1815 John Hopkins. 1816 Henry Deane. 1817 John Hopkins. 1818 Anthony Cox. 1819 John Hopkins. 1820 Anthony Cox. 1821 John Hopkins. 1822 Anthony Cox. 1823 John Hopkins. 1824 Anthony Cox. 1825 John Hopkins. 1826 George Graham. 1827 John Hopkins. (dec’d) – John Bailey. 1828 Thomas Cobbold. 1829 George Graham. 1830 Anthony Cox. 1831 George Graham. 1832 Thomas Cobbold. 1833 George Graham. 1834 John Bailey. 1835 George Graham. 1836 John Sansum. 1837 Capt. George Deane. 1838 George Graham. 1839 Samuel Billingsley. 1840 Samuel Billingsley. 1841 Anthony Cox. (dec’d) – Thomas George. 1842 George Deane. 1843 Thomas Cobbold. 1844 Francis Hales. 1845 Philip Wm. Freshfield. 1846 Benjamin Chas Bolton. 1847 John Pattrick. 1848 Francis Hales. 1849 Francis Hales. 1850 Francis Freeling Hart. 1851 John Pattrick. 1852 Francis Hales. 1853 John Pattrick. 1854 Philip Wm Freshfield. 1855 John Vaux. 1856 John Vaux. 1857 John Stephen. 1858 John Pattrick. 1859 Francis Hales. 1860 John Bowness. 1861 John Bowness. 1862 Francis Hales. 1863 John Pattrick. 1864 John Pattrick. 1865 John Vaux. 1866 John Vaux. 1867 Francis Hales. 1868 Francis Hales. 1869 John Vaux. 1870 John Vaux. 1871 John Vaux. 1872 John Watts. 1873 John Watts. 1874 Francis Hales. 1875 Johnson Richmond. 1876 John Henry Vaux. 1877 William Groom. 1878 John Watts. 1879 John Henry Vaux. 1880 John Henry Vaux. 1881 William Groom. 1882 John Watts. 1883 James Durrant. 1884 Arthur John Hanslip Ward. 1885 John Henry Vaux. 1886 John Henry Vaux. 1887 William Groom. 1888 John Henry Vaux. 1889 James Durrant. 1890 Samuel Robert Groom. 1891 James Durrant. 1892 Martin Daniel King. 1893 William Groom. 1894 James Durrant. 1895 Wm. John Nalborough. 1896 Samuel Evans. 1897 William Blenkinsop Mclearon. 1898 William Groom. 1899 William Groom. 1900 William Groom. 1901 William Groom. 1902 Harry George Everard. 1903 Robert Hill. 1903 Robert Hill. 1909 William Henry Elwell. 1910 Samuel Robert Groom. 1911 Samuel Robert Groom. 1912 Edward Saunders. 1913 Edward Saunders. 1914 Edward Saunders. 1915 Edward Saunders. 1916 Edward Saunders. 1917 Edward Saunders. 1918 Edward Saunders. 1921 Thomas John Denney. 1922 Thomas John Denney. 1923 Lucy Maria Hill. 1924 Lucy Maria Hill. 1925 Albert Richard Hocking Peake. 1926 Albert Richard Hocking Peake. 1927 Arthur Baxter. (dec’d)- Edward Saunders. 1928 Edward Saunders. 1929 Thos. Herbert Firth Bernard. 1930 Robert Almond Ward. 1931 Lucy Maria Hill. 1932 Lucy Maria Hill. 1933 Lucy Maria Hill. 1934 Lucy Maria Hill. 1935 Charles Lewis Hills. 1939 Robert Almond Ward.1940 Robert Almond Ward. 1941 Robert Almond Ward.1942 Blaxland Appleton. 1943 Blaxland Appleton.1944 John Palmer Benstead. 1945 Thomas Davis.1946 Robert Almond Ward. 1947 Ernest Gant.1948 Ernest Gant. 1949 Ernest Gant. 1950 Frank Leslie Horn. 1951 Ernest Gant. 1952 Clarence Arthur Green. 1953 Clarence Arthur Green. 1954 Clarence Arthur Green. 1955 Hilda Winifred Brennan. 1956 Hilda Winifred Brennan. 1957 Clifford Chas.Thurlow. 1958 Arthur Cyril Moles. 1959 Arthur Cyril Moles. 1962 Sidney Charles Simmons. 1963 Harry Gochin. 1964 Harry Gochin. 1965 Edgar Harold Newton. Shipbuilder and tug owner Mr Vaux took a leading part in local maritime affairs, John henry Vaux took over the lease of the shipyard in 1874 following the death of his father, he played a prominent role in the town serving several periods as Mayor. John Vaux died aged only 52 after a short illness on 30th June 1894, John’s wife and daughter decided to continue to run the shipyard themselves with two newly appointed Directors. Alderman William Groom, was one of the most respected businessmen and citizen of Harwich. Mayor in eight separate occasions, a leading figure in the cod fishery, he owned thirty seven barges and built up a thriving business in timber, coal, cement, slate and other materials. Alderman groom was well-known for his philanthropic work, one of the mainstays of the business and commercial life of the borough and a churchwarden for 50 years. He had also been Chairman and director of the Harwich Gas and Coke Company, an ardent conservative and a prominent local freemason. At the end of his final term Harwich Borough Council decided to commemorate his service to the town by having his portrait painted for him which hangs today in the Harwich Guild Hall in return he promised a drinking fountain. The fountain was handed over to Alderman Hall, the Mayor, on July 14th 1904. It was designed by Watts of Colchester and provided for the ‘alleviation of thirst of human beings, cattle and dogs’. About 20 feet high with a lamp at the top, it was made of Cornish granite, polished dark granite and Portland stone. 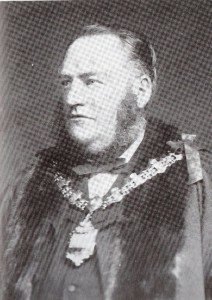 High steward and Freeman of the Borough of Harwich Mr Johnson Ernest Cann, M.B.E. J.P. It was in 1897 that Mr Cann was first elected to the Borough Council. Subsequent years found him serving as mayor, alderman, justice of the peace and freeman of the Borough. Always taking an active interest in education and the needs of the underdog, he was on several educational bodies. Another of his interests was the harbour and he served on Harwich Harbour Conservancy board for a great many years. 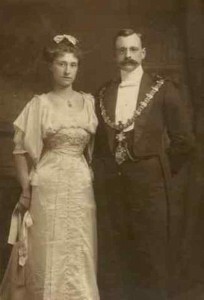 Alderman and Mayor from 1912-1918. The firm of Saunders were well known builders in the area, employing 150 Workers making bricks and tiles. Hillcrest built 1898 and now the premises of Hanslip and Ward, solicitors was built by Edward Saunders, at the rear were his yard and workshops. His hill Crest estate included Brooklyn Road and Oakland Road. Some of the Buildings that were built by Edward Saunders include. Wesleyan Methodist Church, the Empire Cinema, Harwich County Primary School, St.George;s School, Second Avenue Infants, Brooklyn Road, and Oakland Road. Edward Street in Parkeston is named after Mr. Saunders. Lucy Hill (nee Roberts) was the first women elected as Mayor in the interwar period in Harwich in 1923-25 and 1931-35. Born in St Pancras, her father was an auctioneer, and she was living there with her widowed mother in 1901. Her father was Alexander Roberts (1836) and her mother, Fanny (1832). In 1901 she was living with her widowed mother in St Pancras. In 1909 she married Robert Hall JP (1847), Harwich coal merchant and councillor, who was twenty years her senior. She was active in the British Legion and nursing causes (St John’s Ambulance, District Nursing Association, Volunteer Aid Detachment). 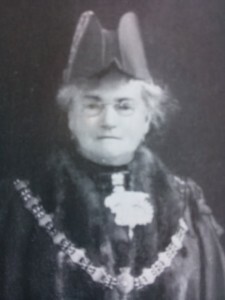 She was the first woman councillor in Harwich in 1921 and (unusually) became mayor just two years afterwards. Harwich was a Liberal constituency in the 1920s and Liberal National in the 1930s, so her Liberal alignment was unsurprising. A native of St. Osyth, Mr. Davis came to Harwich from Witham in 1912 and was first elected to the council in 1929 as a representative of the former Harwich Ward. 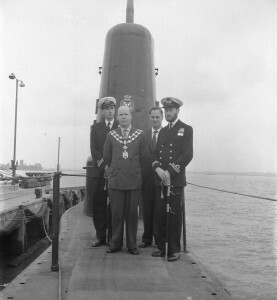 He served continuously for 18 years and became Mayor of the borough in November 1945. 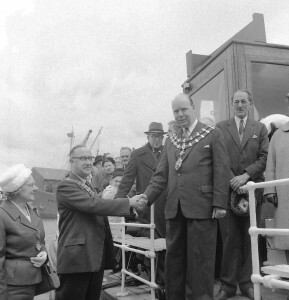 One of his first duties as Mayor was to welcome, in December 1945, a delegation from the Town Council of Esbjerg, who came to Harwich to make a presentation to the borough to mark the re-opening of the shipping service between Harwich and Denmark after its war-time break. In May 1946 Mr .Davis led the Harwich Council party who paid a return visit to Denmark and presented to the Esbjerg Council a gift, a plaque of English bearing the Harwich borough arms in full colour. Colonel Ward came to Harwich in July, 1882, as a young solicitor and set up a practice. 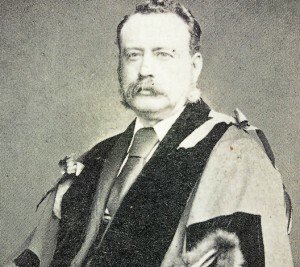 His first active association with the municipal life of the borough was in November, 1883, when he was one of seven candidates for four seats on the council and was placed third in the poll. At that time the borough was not split in wards but four councillors were elected for the whole district each year. In his election address on that occasion Colonel Ward referred to himself as “a young inhabitant and comparative stranger to many” and went on to say, “The removal of the G.E.R. Works to Parkeston has already been seriously felt in Harwich and any scheme to alleviate the depression in trade, to bring further business into the town and to advance Harwich and Dovercourt as a seaside resort will receive my hearty support. A year after his election to the council he became Mayor of the borough in November, 1884, and regularly sat on the Bench as Chief Magistrate. At the time he became Mayor he was only 25 years of age and is generally believed to have been the youngest Mayor the borough had known. A native of Harwich, Alderman Hills was exceedingly proud of the ancient borough and it came as a fitting climax to his long period of service in town affairs when in 1935 he became Mayor and chief magistrate of the borough. The two years during which Alderman Hills was Mayor were marked by a number of important local and national events. He entered into his duties with enormous enthusiasm and scarcely an organisation sought his services in vain. Alderman Hill was and old member of the “Star in the East” Lodge of Freemasons, and also the Mark and Chapter Lodges. 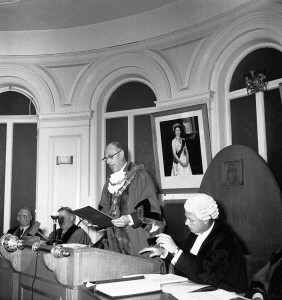 It was in 1942 on the twentieth anniversary of his becoming a member of the council that Mr Appleton was elected Mayor and Chief Magistrate, and to this office he brought considerable enthusiasm. So satisfactorily did he carry out his duties that he was asked to continue office for a further year. A native of Lowestoft, Mrs. Brennan was elected to Harwich Borough Council in November 1947, and in May 1955 was chosen to be Mayor. She was only the second woman to be Mayor in the 350 years that Harwich had been a borough, and was the third Labour Mayor of the district. Mrs. Brennan was Mayor for two years, and Deputy-Mayor for a year after that. She moved from Lowestoft to Colchester with her parents where she lived for 20 years, and was resident of Harwich for about 40 years. Her keen drive to get things done was borne out of her work for Harwich and District Fellowship for the Sick. For nine years she campaigned to provide maternity home accommodation for the borough. In April 1951 she posted a petition with 5,000 signatures to the Minister of Health to assist the campaign. Her determination paid dividends, for in 1959 the £49,000 maternity wing to Harwich and District Hospital was completed. Cyril Moles was awarded the MBE in 1967 for his services to young people in Essex Born in Weymouth, Mr. Moles was educated at St John’s School, Chelmsford, and Fleet School in Hampshire, and during the war served as a signalman in both the Army and the RAF. He moved to Dovercourt from Colchester towards the end of the war and opened the outfitting company of A C Moles in the High Street in 1949. 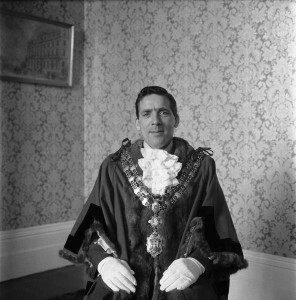 Mr. Moles was elected to Harwich Borough Council in 1949, serving for 22 years, during which time he was deputy mayor in 1954-5, mayor in 1958 and 1959 and became an alderman in 1961. Among positions Mr. Moles held over the years were: chairman of the divisional committee for further education, the coastal area youth committee, Harwich Further Education Centre, Harwich group primary schools, Harwich and District attendance and care committee, president of Essex County Boys’ Brigade. 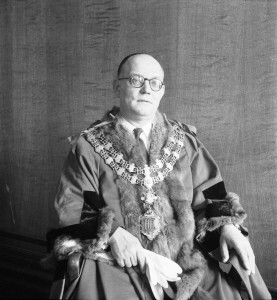 Mr. Newton was mayor 1965-66, was returned to the council in 1961. He was a student at Reading University and served with the Royal Flying Corps from 1917-1919, afterwards becoming headmaster of Silver End School for 30 years until his retirement. Mr. Newton lived in the district for 11 years. Born in Strood in Kent, Mr Simmons came to Dovercourt in 1947 to set up a business as a watchmaker and jeweller. an Independent, Mr Simmons began his council career in 1952 when he was elected to the old Harwich Borough Council, He was also returned with a comfortable majority in 1958, and Mr Simmons was chosen for mayor three years running from 1960-1963, But in 1964 he lost his seat – defeated in the electing by Mr William Bleakley. Mr Simmons was prominent in setting up of the Harwich branch of the Round Table and in establishing Navyard Wharf. 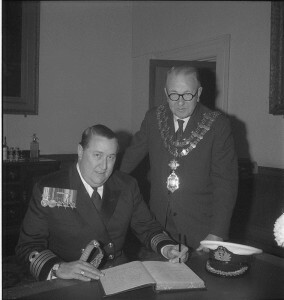 Peter Holbrook was Mayor of Harwich from 1968-1970. He was first elected to the borough council in 1965 as an Independent and then as a Liberal to the new Tendring Council in 1974. Born in Ceylon, his father Charles was port Superintendant in Colombo. When he returned the UK he lied about his age in order to join the Home Guard. In 1943, he signed his indentures as a Corporation of Trinity Lights Division apprentice. 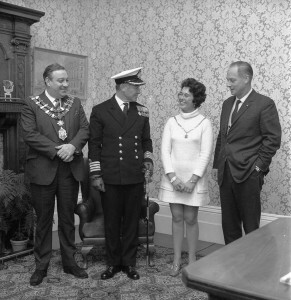 During his time as mayor, he piloted the first arrival of the new ship Koningin Juliana to Parkeston Quay wearing both the chain of office and trinity house pilotage uniform. He married Betty in 1953 and they had a daughter, a son and four grandchildren. Bill, who was born in Stranraer and was a keen rugby player, was a landing officer, Bill & his wife Molly had four children and seven grandchildren. Bill joined Harwich Borough Council in 1964 and also served on Essex County Council and Tendring Council, on which he was still portfolio holder for finance. He became mayor of Harwich in 1970, and for many years was the only Conservative member on the council. Harwich MP Douglas Carswell described Mr. Bleakley as a “pillar” of the community. Mr. Thorn was educated at Harwich High School and on leaving joined the Harwich & Manningtree Standard as a junior reporter. As editor he trained many young journalists who later went on to work on nationals. He was first elected to Harwich Borough Council in 1960, representing East Ward, became Alderman in 1970 and was mayor in 1971 and 72. After government reorganization he served as a Tendring district councilor and Harwich Town councilor until 1983. Born in Birmingham and educated at Coventry Grammar School and Birmingham University, He graduated in 1927 and after teaching briefly at Lichfield, he was appointed History Teacher at Harwich High School in 1929m a post he held until 1971. In 1930 he served on the Borough’s Muniuments Committee, cataloguing and preserving all the old documents in the Guildhall. In the Second World War he served in the RAF Education Branch training instructors. He returned to Harwich in 1945 and was elected as a Harwich Borough Councillor. In 1949 he was made Alderman and was the last Mayor of the Borough of Harwich in 1973. Concerned with post war demolition and consequential street widening, he led the lobby for the restoration of old properties. Starting in 1960 with the restoration of 30 and 31 West Street, and with the ultimately to get about a dozen building restored in Old Harwich which would otherwise have been demolished. He regarded his biggest success the rebuilding of Currents Lane in 1973, bringing in Brighton architects Fitzroy Robinson. He was appointed Honorary Archivist to Harwich Town Council in 1973 and spent enormous amounts of time researching the town records in the Guildhall. 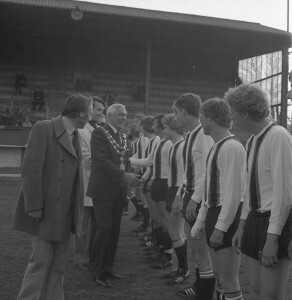 Mr Meachen became the first town mayor in 1974, when the borough council was taken over by Tendring Council. His daughter, Debbie Rotchell, said: “He was Harwich born and bred and all his family still live here. Mr Meachen, of Shaftesbury Road, Dovercourt, was involved in local government for about 11 years and was a Liberal. He represented the Harwich East ward. 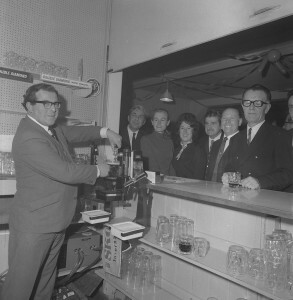 Mr Yallop moved to Dovercourt from Ipswich in the 1960’s. He was first elected to the town council in 1979, representing West Ward, and later became a Tendring Councillor. 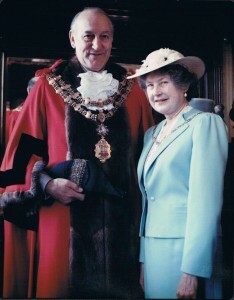 He was Harwich Mayor in 1982, with his wife Beryl as mayoress. Mr Yallop was initially manager of Ferry Motors in West Street, and then became its owner. He was a member of Harwich Chamber of Trade and Commerce for many years, serving as vice chairman and chairman and through the Chamber did a lot of the work ensuring cruise crews were bussed into Harwich. Steven Henderson served on Tendring Council for 20 years before losing his Harwich West Central seat at the 2011 elections. He was also on Harwich Town Council for 28 years. Mr. Henderson had served under the Labour, Independent and Community Representative Banners. 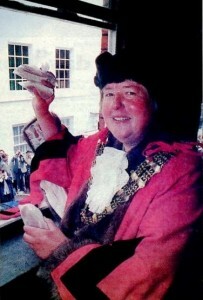 Mr Henderson was mayor from 1992-1993. Les Double served as a Harwich Town councilor for 22 years. He also represented Harwich West ward at Tendring District Council since 1995 and was party leader for 12 years. from 1997 to 2009 he served three terms as the town’s Essex County Councilor. In addition to being a councilor, Mr. Double was a governor of the Harwich School and a director of the East of England Cooperative Society. A statement published on the Harwich Labour Party website read: “Les was the driving force behind so much of what has been achieved locally, including the remarkable Harwich Connexions. Mr Double was mayor 1995-1996, 2003-2004. Mr Good was a Harwich fisherman for 50 years, often selling his catch from the quayside before he came ashore in 1962 to run a wholesale business in Church Street. He first stood for election to Harwich Borough Council in the late 1960s, continuing as a member of the town council following local government re-organisation. He also became a member of Tendring Council in 1973, serving for more than 20 years, during which time he was chairman of most of the district council’s committees and leader of the Conservative Group. He was mayor of Harwich in 1977. 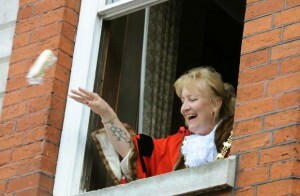 Mrs Good served on Harwich Town Council for 12 years. 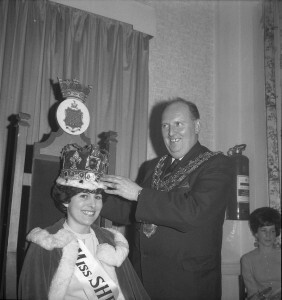 She was mayoress in 1977 and mayor in 1986. Both had various interests outside their council work and had a long association with the Royal British Legion and Harwich Community Association. One of 17 children, she was born at Greenock on Clydeside, but came to Harwich in 1941. A founder member of the Townswomen’s Guild, she was a member of the Harwich Society and she petitioned for the maternity unit at Harwich Hospital. Mrs Potter served on Harwich Borough Council, and later the town council, from 1969 to 1998, and was a Tendring district councillor from 1973 to 1983 and mayor from 1977 to 1977. Jeff Spall was born in Newcastle in 1933, Master Mariner he served at sea for 18 years and taught Nautical School for two years. 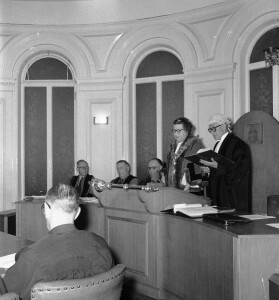 A Member of the Town Council and Mayor from 1978-1979. 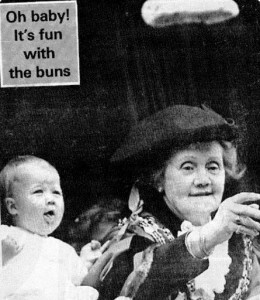 During her year of office as mayor (1985-86), Mrs Elleby, an SDP member, was involved in many community activities including Harwich and Dovercourt Rugby Club and Harwich and District Community Association. Mrs Elleby retired after 37 years in 1986 working as civil servant at Colchester Garrison medical centre. Gerald Wallington-Hayes was born in Paulton (Somerset) in 1930, previously served in the Merchant Navy for sixteen years. He joined P&O Ferries in 1950 as a junior purser, travelling on the company’s Royal Mail ships through the Mediterranean, to India, Australia and New Zealand. In 1957, he joined Ellerman Lines ships as Chief Steward, visiting exotic places such as the Panama Canal. Mr Wallington-Hayes, was honoured to be awarded an MBE for community services in 2003. Gerald Wallington-Hayes, died aged 86 in 2016. Born in Clapham, London, Mr Robson and his wife Susanne first moved to Dovercourt in 1996 – two years after they married – and moved a number of times before settling in Mayes Lane, Ramsey. The former train driver first became councillor with the then Harwich Borough Council before continuing as a member for Harwich West on Harwich Town Council. Mr Robson died in Essex County Hospital in Colchester in 1996. He was 59. Ann was born in Karlskrona, on the south east corner of Sweden, Ann moved to London at the age of 4, and arrived via Harwich. Her father had been appointed Chaplain to the Royal Swedish Embassy and was in effect Pastor to the Swedish Community. After moving back to Sweden Ann moved back to England and after school was over found work in an old people’s home and also a home help, both jobs gave her quite and insight into current social problems. Ann came to Harwich first in 1982 because all students came in through Parkeston Quay. She moved to Harwich in 1985 and a year later joined the local Labour Party where she became organiser for the West Central Ward. A change in the law in 1996 made her eligible (as an EU citizen) to stand as a candidate for local government. Two months later she was elected to District and Town Council in a bye election caused by the death of Dudley Robson. Ann Evander was believed to be the first non-Briton to take up the post in the whole of the UK in 1999. 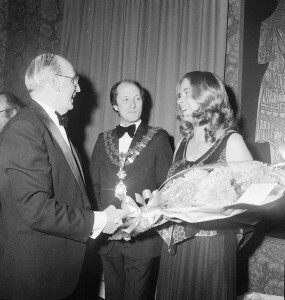 And both the Prime Minister and Foreign Secretary Robin Cook wrote to congratulate Swedish-born Miss Evander. Tony Blair said he was “delighted to hear of her election and Mr Cook offered his warmest congratulations”. 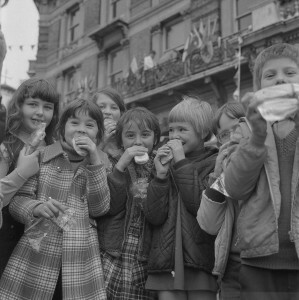 In time-honored fashion, children from primary schools gathered outside the Guildhall as Mr. Ford threw them kitchels, a spiced bun filled with currants. He outlined his plans for the coming year, which include a photography competition and subsequent charity calendar, as well as a visit of Prince Philip to the new Trinity House building. He became mayor of Harwich in 2005, and for many years was the only Conservative member on the council. Stephanie was elected to Harwich Town Council in 2007 representing the Community Representatives Party, but later served as an independent councillor. She was Harwich mayor in 2010/11 and spent much of her life volunteering, raising money for charities associated with her illness and pressuring politicians on health issues. Stephanie Tyrer died at her Dovercourt home, aged 48, following a life-long battle with congenital heart disease. 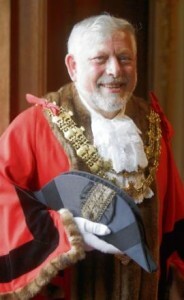 Councillor Barry Brown put on the red mayoral robes and chain before parading to St Nicholas Church after he was named Harwich mayor at The Guildhall on Thursday May 26 2011. 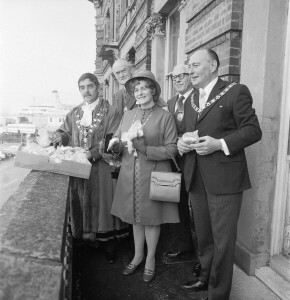 Mr. Brown with his wife and the new Mayoress, Eleanor, then threw kitchels from the Guildhall; a grade II listed building, as nearby primary school children gathered below in the traditional ceremony dating back more than 400 years. 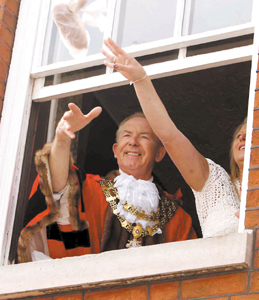 Harwich’s new mayor threw kitchels to crowds of delighted children as part of the town’s traditional mayor-making ceremony on Thursday 19th May 2016. Pam Morrison followed in the footsteps of her late husband Andy, a former Harwich Town Council mayor who passed away in 2012. “I will take a lot of how I deal with my role as mayor from Andy, who was Harwich born and bred. “I may have not been born here, but when I came I found this wonderful close-knit community. Mrs Morrison steps into the shoes of fellow Harwich town councillor Dave McLeod, who said he had been honoured to have been mayor on five occasions. 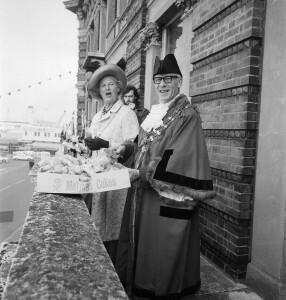 Mr Brown, with his wife and the new mayoress, Carol, then threw kitchels from the Guildhall, a Grade II listed building, in the traditional ceremony dating back more than 400 years. Mr Brown said he was delighted to finally become mayor. He said: “I’m really pleased. “I’ve been nearly there before and missed out and this time it has gone through. “I’m now looking forward to the challenge of the role. “One of my big ideas is if I can encourage businesses to come to the town. Paul Turvey and all those who have contributed to this project. So many people have information and images stored away in boxes that have not seen the light of day for many years. we would love to have as much of Harwich & Dovercourt’s History as we can documented on this site.